This chapter faces the Web accessibility issue from the perspective of Web Information Systems Quality, which is the main topic of the handbook. The closed relation between both issues (and also standard Web technologies) will be explained. It will be proven that Web accessibility does not imply any extra effort; it is a consequence of good development and design practices. In order to achieve this objective the basic topics related to Web accessibility will be defined and necessary introductory information will be exposed, in order to set the basis for the understanding of the points of discussion, which form the main content of the chapter. Also, some benefits of Web accessibility will be proven and the myths related to Web accessibility will be refuted. By the end of the chapter, the future trends and the newest standard Web technologies that have been designed, taking into account Web accessibility needs, will be introduced. XFrames: XFrames is an XML application for composing documents together, replacing HTML Frames. By being a separate application from XHTML, it allows content negotiation to determine if the user agent accepts frames; by encoding the “population” of frames in the URI, it allows framesets to be bookmarked. XFrames allows similar functionality to HTML Frames, with fewer usability problems, principally by making the content of the frameset visible in its URI. W3C: The World Wide Web Consortium (W3C) is an international consortium where Member organizations, a full-time staff, and the public work together to develop Web standards. 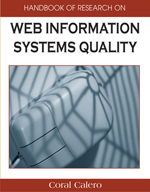 W3C’s mission is to lead the World Wide Web to its full potential by developing protocols and guidelines that ensure long-term growth for the Web. XForms: XForms is W3C’s name for a specification of Web forms that can be used with a wide variety of platforms including desktop computers, hand-helds, information appliances, and even paper. XForms started life as a subgroup of the HTML Working Group, but has now been spun off as an independent Activity. Assistive Technologies: Technologies that provides greater independence for people with disabilities by enabling them to perform tasks that they were formerly unable to accomplish, or had great difficulty accomplishing, by providing enhancements to or changed methods of interacting with the technology needed to accomplish such tasks. The most relevant assistive technologies are: screen magnifiers, screen readers, voice recognition software, alternative keyboards and alternative pointing devices. WCAG: The Web Content Accessibility Guidelines (WCAG) are general principles of accessible design. The current version is WCAG 1.0, which has 14 guidelines; each one has one or more checkpoints that explain how the guideline applies in a specific area. WCAG 2.0 is nowadays being developed to apply to different Web technologies, be easier to use and understand, and be more precisely testable. XHTML 2.0: XHTML 2 is a general purpose markup language designed for representing documents for a wide range of purposes across the World Wide Web. To this end, it does not attempt to be all things to all people, supplying every possible markup idiom, but to supply a generally useful set of elements, with the possibility of extension using the class and role attributes on the span and div elements in combination with style sheets, and attributes from the metadata attributes collection. Section 508: Section of the Rehabilitation Act focused in “Electronic and Information Technology.” Section 508 requires Federal agencies to make their electronic and information technology accessible to people with disabilities. It was enacted to eliminate barriers in information technology, to make available new opportunities for people with disabilities, and to encourage development of technologies that will help achieve these goals. The law applies to all Federal agencies when they develop, procure, maintain, or use electronic and information technology. WAI: The Web Accessibility Initiative (WAI) is the section of W3C that works with organizations around the world to develop strategies, guidelines, and resources to help make the Web accessible to people with disabilities. All these products are possible thanks to the participation of volunteers from around the world that are included in the different working groups. Disability: Physical or mental impairment which has an adverse effect on the ability to carry out normal day-to-day activities. The term is often used to refer to individual functioning, including physical impairment, sensory impairment, cognitive impairment, intellectual impairment or mental health issue. Web Accessibility: Web accessibility means that everybody can access and use (perceive, understand, navigate, and interact with) the Web, regardless of disability.